This panel displays the entire data table of a vector layer. The title of panel can close the panel. The second line displays the name of the currently selected data table. Clicking on this line displays the list of the available vector layers and tables to choose one of them. 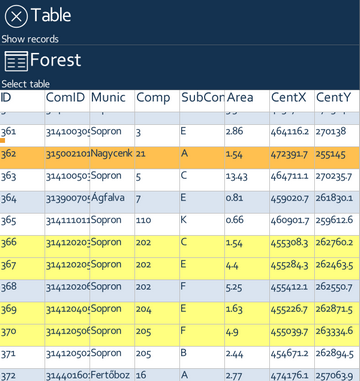 The remaining large table area displays the data records (rows) and data fields (columns). The table area can be scrolled into any direction. The most left part of this area is the quick scrolling area. Every record can be selected for editing. Selected records appear with yellow, the currently edited record with orange background in the table.